Agricultural production is stalling and the current farming model may be unsustainable but there is potential for the East of England to make a radical improvement to global agricultural productivity, according to a trilogy of reports released over the last few months: AgriTech East’s A Vision for AgriTech; From Grass Roots to Blue Sky; The East of England Science and Innovation Audit and AgFunder’s Investing in AgriFood Tech Report. With new evidence supporting the business and environmental case for ARC, our intended AgriTech site in south Cambridgeshire, mounting up, we wanted to share these brief overviews of each report. 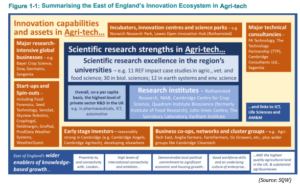 Agri-Tech East supports the growth of a world-leading cluster of innovative farmers, food producers & processors, scientists, technologists and entrepreneurs with a shared vision of improving the productivity, profitability and sustainability of agriculture. Bringing people together from different spheres of industry and science to turn challenges into business opportunities and facilitate mutually beneficial collaboration, Agri-Tech East is well positioned to understand and influence the bigger picture and to create a realistic vision for the future of AgriTech in the East of England. Calling for an independent mechanism to validate the productivity benefits of agri-technologies. Launched at VentureFest East last month, this report is a deep-dive survey of cutting edge innovation taking place in industry and the public sector. Each region conducts such a survey each year, the purpose being to better inform central Government of regional strengths for potential future funding streams and to assist with foreign direct investment. It presents a powerful case for further strengthening the mechanisms for commercialisation in order to bring major economic benefits to the region and to the national economy. AgFunder is the premier marketplace for the most promising AgriFood Tech startups seeking to raise investment capital from accredited investors. Its mid year AgriFood Tech Investing Report evidences the sector rebounding from 2016 lows with large deals in the food delivery segment making the most significant contribution to the year-over-year growth in total funding and Series A deals, in spite of an overall 27% decline in real activity across stages. It reveals that much of the decline in deal activity happened at the seed stage, where deal count dropped 37% year-over-year and suggests that this decline could be attributed to investor fatigue with “me-too” companies, particularly in food delivery and digital agriculture. The investor base participating in agrifood tech investing continued to diversify with 702 unique investors participating during the half, including Silicon Valley venture firms, state-backed government funds, pension funds, corporate entities and a growing number of agrifood tech specialists. With corporate activity slowly picking up too (though still only representing 2% of deal activity), contributing to the small number of venture capital exits, the overall picture is one that can be met with cautious optimism. 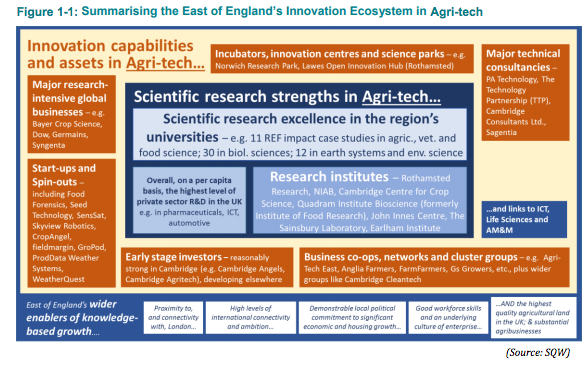 With further reports from key influencers due out soon, we’ll be sure to keep you up to date with all stat’s and facts relating to local development, the life-sciences and AgriTech in the East of England as and when they enter the public domain.